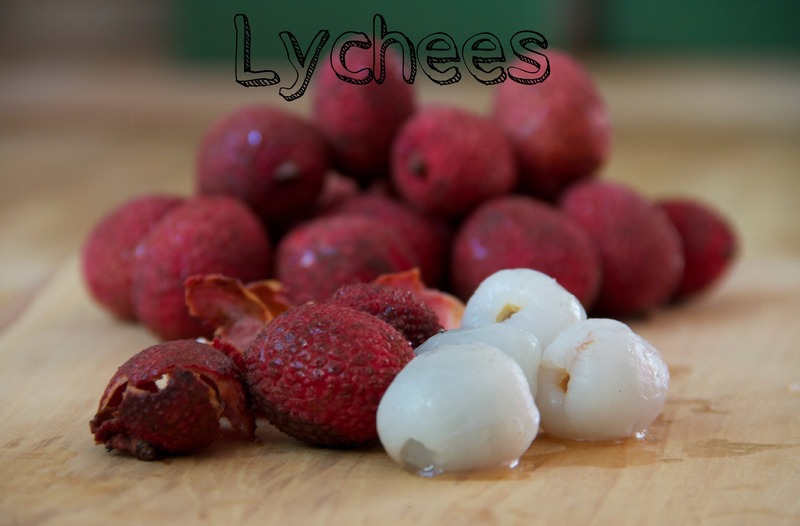 Lychees, lychees, lychees. If you haven’t tried them now is the time. 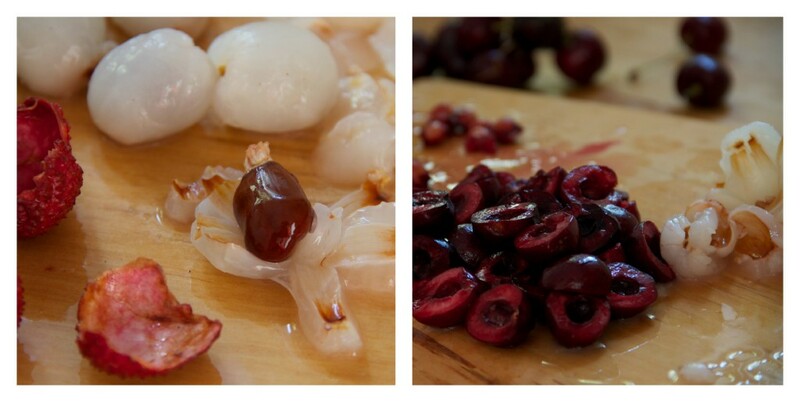 Lychees have an unusually bumpy/prickly peel that hides their sweet, juicy fruit that surrounds a ruby lacquered pit. I had never seen them before I stumbled across them in A-one grocery store years ago. But once I tasted their sweetness I was sold. So you can imagine my delight when Oakley over at Frieda’s Produce offered to send me some. I couldn’t wait to dig in. But then I got to thinking, what type of recipes use lychees? I had only eaten fresh lychees. Could I use them in a dessert for a luncheon with some food blogger friends? My cursory search on the web pointed me to drinks and sorbets. Good thoughts but not what I was looking for. Then I remembered that Cathy from She Paused for Thought wrote a comment on my mango and cherry clafloutis about using lychees instead of mangoes. It’s good to know a friend who has traveled extensively and will eat just about anything…once. I was sold. A word of advice, make sure you buy twice the amount of lychees than the recipe calls for, I peeled one for the recipe and one for me. Judy, what a creative pairing! 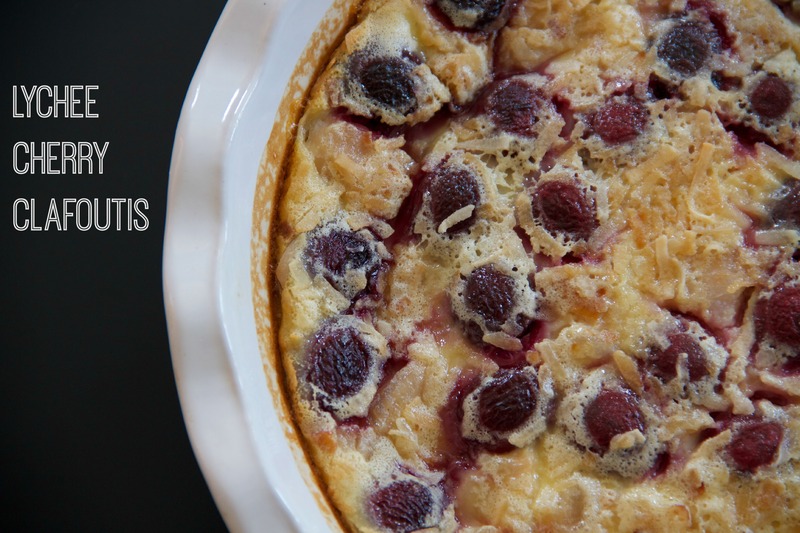 I would never have thought to add lychees to a clafoutis. It looks spectacular, a perfect summer dessert. I wish I could take credit for this creativity, although I will take credit for surrounding myself with creative people. And I include you in this group. I’m totally making this for the 4th! Thanks Janie. This is my go to, ‘what am I going to make?’ recipe. Just add any fruit and it’s a winner. Lychees and cherries. Now, why didn’t WE think of that pairing! 🙂 So glad you enjoyed the lychees. Oh no!!! So sorry. I get that reaction when I eat kiwis. Thanks again for the lychees. I loved this recipe. It is the perfect ending to any meal.